The client had an extensive global multiprotocol label switching (MPLS) network with over 30 Gbps of bandwidth. However, the client was experiencing bandwidth growth of >30% compound annual growth rate (CAGR) and foresaw increasing demands for multi-media applications, data center to data center traffic, and cloud solution usage to support its business units and global workforce. 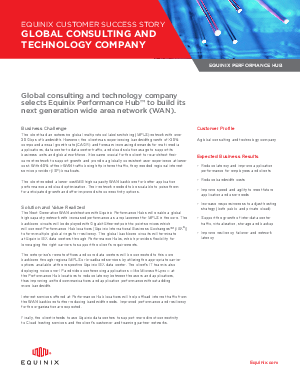 It became crucial for the client to re-architect their current network to support growth and provide a globally consistent user experience at lower cost. With 40% of their WAN traffic being http internet traffic, they needed regional internet service provider (ISP) breakouts. The client needed a lower cost/MB high capacity WAN backbone for better application performance and cloud optimization. Their network needed to be scalable to poise them for anticipated growth and offer improved site connectivity options.